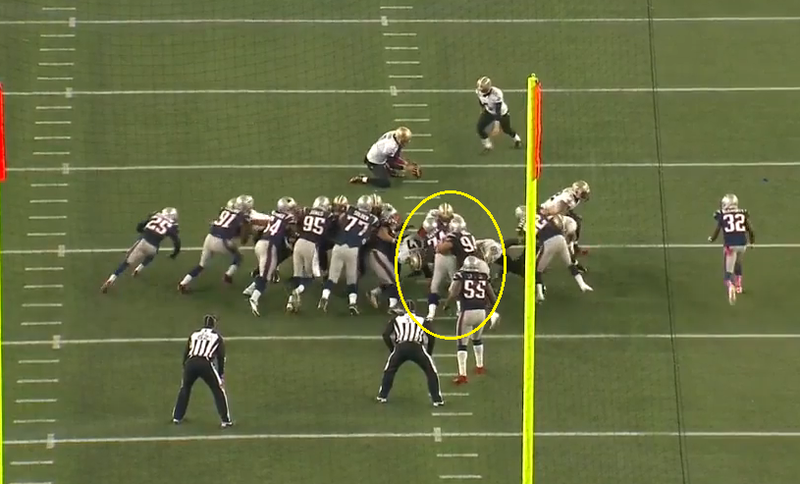 You're looking at a screengrab from last weeks' New England win over the Saints, shared by the Globe's Ben Volin. On a New Orleans field goal attempt, rookie tackle Chris Jones is pushing Will Svitek into the offensive lineman. It's the same illegal move, with the same two players, that got the Pats flagged against the Jets last night. This was a designed play, and the Jets reportedly knew it was coming—and alerted officials to look for it. Despite the controversy over the NFL's initial description of the wording, the rule is the rule, and the Patriots ran afoul of it on Nick Folk's missed 56-yard attempt in overtime. Even Bill Belichick, who thought it had been misapplied yesterday, has come around, telling ESPN he's seen the light. "Obviously we are wrong," he said, before adding: "It's our job to understand the rules. Whatever the bottom line is, we didn't do it properly." But is Belichick just mad he finally got caught? The Patriots had used the push move at least once before yesterday. Perhaps his mistake was using it against coaching brothers. But whether Rob Ryan alerted Rex or the Jets picked it up on their own, NFL.com's Albert Breer reports that the flag was thrown in part because Jets coaches told officials to be on the lookout for a push during FG block attempts. The obscure penalty that hadn't been called until Week 7 might still be uncalled if the Jets hadn't tattled—and the Patriots might be 6-1. But that's the risk you run by playing just outside the rules: sometimes you get caught.